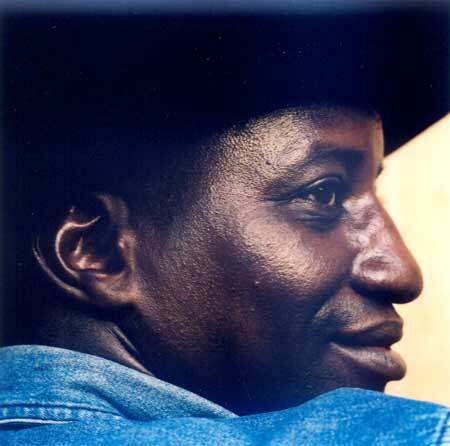 Lobi Traoré (1962 – 1 June 2010) was a Malian musician. He was born in 1962 in Segou Bakaridiara in the province of Farako, just behind the river Niger. His father was a great Komo singer, and his uncle was a traditional violin player. Lobi’s father gave up Komo singing to become an Imam (muslim priest), for if one wishes to study Islam, it is forbidden to be a part of a secret society associated with animist traditions. Lobi started playing shakers at a young age at local weddings and his talent was immediately noticed. During his teenage years, while studying timbales, he saw another man playing an acoustic guitar and was immediately struck by its beautiful sound. He was soon spending all his time playing. Lobi is the creator of an amazingly unique mix of blues and African music. He has been living in Bamako for fifteen years and can be found playing at clubs many nights of the week. Lobi has played in many European countries, Canada, Mozambique, South Africa and all of the countries of West Africa. His music has been recognized by many blues aficionados from around the world for its gritty, powerful soul. This tune has the coolest bass drum/bass line! THE GUITAR TONE IS SO DOPE!